Seasoned industry expert to lead the organization’s science and technology initiatives. We are pleased to have worked with Slone Partners on this important search. Linda is truly a remarkable scientist and a perfect cultural fit for our organization,” said Chairwoman and CEO of Cambridge Biomedical, Barbara Osband. 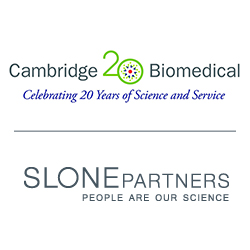 National executive search firm, Slone Partners, announces the placement of Linda Robbie, PhD, a well-versed leader with extensive assay development and biomarker expertise, as VP of Scientific Affairs at Cambridge Biomedical. Established in 1997, Cambridge Biomedical is a Boston CRO specializing in bio-analytical assay development and sample testing services. The organization acts as a leading provider of customized assays for small and large molecules, biomarkers, and diagnostics. In her new role, Dr. Robbie will serve as the head of science and innovation and will lead and direct all initiatives related to science and technology, clinical operations, and project management. “Linda is an exceptional addition to our leadership team. Leveraging her unique people management skills and years of successful technology implementation, she will act as our key scientific point person interfacing with both our clients and internal teams. We are pleased to have worked with Slone Partners on this important search. Linda is truly a remarkable scientist and a perfect cultural fit for our organization,” said Chairwoman and CEO of Cambridge Biomedical, Barbara Osband. Prior to joining Cambridge Biomedical, Dr. Robbie served as the Global Senior Director of Biomarkers and Translational Science at Q² Solutions Laboratories, a Quintiles-Quest Joint Venture, where she led assay development teams in the U.S. and overseas. Dr. Robbie earned a Bachelor of Science, with honors, in Biochemistry from Heriot-Watt University in Edinburgh, Scotland, and a PhD, in Immunohematology from the Institute of Medical Science, Aberdeen University, Scotland. Cambridge Biomedical, based in Boston, MA, supports sponsors by developing customized assays for small and large molecules, biomarkers and other critical analytes, along with validation and sample testing in CLIA-certified and CAP-accredited, GLP/GCLP-compliant facilities. Cambridge Biomedical has extensive expertise in assay development, optimization and validation, and offers analytical support for PK/PD studies, biomarker development, clinical assay development, assay validation, specimen analysis and testing services. For more information, visit the website at http://www.cambridgebiomedical.com, email info(at)cambridgebiomedical(dot)com or call 617.456.0700.